The Macedonian Dynasty saw expansion and the Byzantine Renaissance, but also instability, due to competition among nobles in the theme system. Shortly after the extended controversy over the Byzantine Iconoclasm, the Byzantine Empire would recover under the Macedonian Dynasty, starting in 867 CE. The Macedonian Dynasty saw the Byzantine Renaissance, a time of increased interest in classical scholarship and the assimilation of classical motifs into Christian artwork. The empire also expanded during this period, conquering Crete, Cyprus, and most of Syria. However, the Macedonian Dynasty also saw increasing dissatisfaction and competition for land among nobles in the theme system, which weakened the authority of the emperors and led to instability. Byzantine Renaissance: The time during the Macedonian Dynasty when art, literature, science, and philosophy flourished. Shortly after the extended controversy over iconoclasm, which more or less ended (at least in the east) with the regent Theodora reinstating icon worship in 842 CE, Emperor Basil I founded a new dynasty, the Macedonian Dynasty, in 867 CE. Basil was born a simple peasant in the Byzantine theme of Macedonia; he rose in the Imperial Court, and usurped the imperial throne from Emperor Michael III (r. 842-867). Despite his humble origins, he showed great ability in running the affairs of state, leading to a revival of imperial power and a renaissance of Byzantine art. He was perceived by the Byzantines as one of their greatest emperors, and the Macedonian Dynasty ruled over what is regarded as the most glorious and prosperous era of the Byzantine Empire. It was under this dynasty that the Byzantine Empire would recover from its previous turmoil, and become the most powerful state in the medieval world. This was also a period of cultural and artistic flowering in the Byzantine world. The cities of the empire expanded, and affluence spread across the provinces because of the new-found security. The population rose, and production increased, stimulating new demand, while also helping to encourage trade. The iconoclast movement experienced a steep decline; the decline was advantageous to the emperors who had softly suppressed iconoclasm, and to the reconciliation of the religious strife that had drained the imperial resources in the previous centuries. Emperor Basil I: A depiction of Byzantine Emperor Basil I, of the Macedonian Dynasty, on horseback. The time of the Macedonian Dynasty’s rule over the Byzantine Empire is sometimes called the Byzantine Renaissance or the Macedonian Renaissance. A long period of military struggle for survival had recently dominated the life of the Byzantine Empire, but the Macedonians ushered in an age when art and literature once again flourished. The classical Greco-Roman heritage of Byzantium was central to the writers and artists of the period. Byzantine scholars, most notably Leo the Mathematician, read the scientific and philosophical works of the ancient Greeks and expanded upon them. Artists adopted their naturalistic style and complex techniques from ancient Greek and Roman art, and mixed them with Christian themes. Byzantine painting from this period would have a strong influence on the later painters of the Italian Renaissance. The Macedonian Dynasty also oversaw the expansion of the Byzantine Empire, which went on the offensive against its enemies. For example, Emperor Nikephoros II Phokas (who ruled from 912 CE-969 CE) pursued an aggressive policy of expansion. Before rising to the throne, he had conquered Crete from the Muslims, and as emperor he led the conquest of Cyprus and most of Syria. The Macedonian period also included events of momentous religious significance. The conversion of the Bulgarians, Serbs, and Rus’ to Orthodox Christianity permanently changed the religious map of Europe, and still impacts demographics today. Cyril and Methodius, two Byzantine Greek brothers, contributed significantly to the Christianization of the Slavs, and in the process devised the Glagolitic alphabet, ancestor to the Cyrillic script. Throughout this period there was great competition among nobles for land in the theme system. Since such governors could collect taxes and control the military forces of their themes, they became independent of the emperors and acted independently, weakening the authority of the emperors. They tended to increase taxes on small farmers in order to enrich themselves, thereby causing massive dissatisfaction. The centuries-long gradual religious separation between the Eastern and Western Roman Empires culminated in the institutional separation known as the East-West Schism. By the turn of the millennium, the Eastern and Western Roman Empires had been gradually separating along religious fault lines for centuries. A separation in the Roman world can be marked with the construction of Constantine The Great’s New Rome in Byzantium. The Byzantine Iconoclasm, in particular, widened the growing divergence and tension between east and west—the Western Church remained firmly in support of the use of religious images—though the church was still unified at this time. In response, the pope in the west declared a new emperor in Charlemagne, solidifying the rift and causing outrage in the east. The empire in the west became known as the Holy Roman Empire. Finally, 1054 CE saw the East-West Schism: the formal declaration of institutional separation between east, into the Orthodox Church (now Eastern Orthodox Church), and west, into the Catholic Church (now Roman Catholic Church). East-West Schism: The formal institutional separation in 1054 CE between the Eastern Church of the Byzantine Empire (into the Orthodox Church, now called the Eastern Orthodox Church) and the Western Church of the Holy Roman Empire (into the Catholic Church, now called the Roman Catholic Church). Iconoclasm: The destruction or prohibition of religious icons and other images or monuments for religious or political motives. 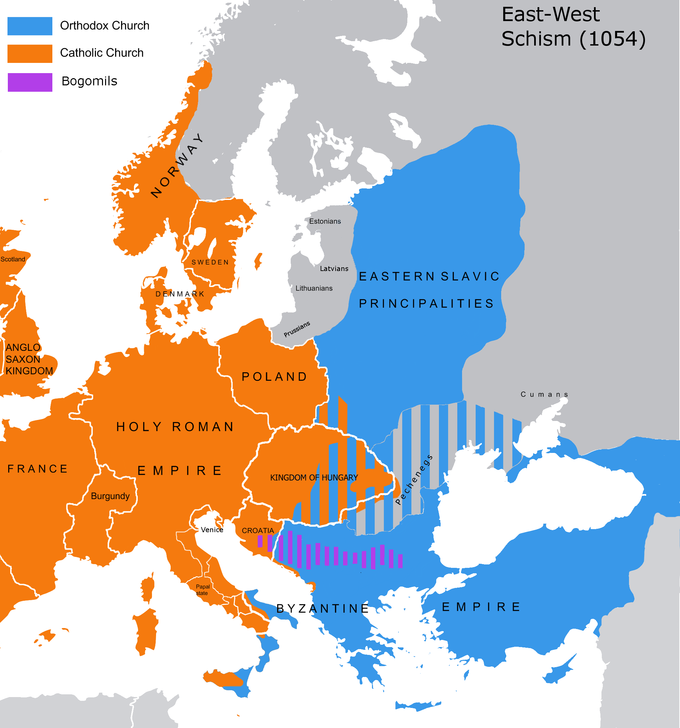 The East-West Schism, also called the Great Schism and the Schism of 1054, was the break of communion between what are now the Eastern Orthodox and Catholic churches, which has lasted since the 11th century. The ecclesiastical differences and theological disputes between the Greek east and Latin west pre-existed the formal rupture that occurred in 1054. Prominent among these were the issues of the source of the Holy Spirit, whether leavened or unleavened bread should be used in the Eucharist, the Bishop of Rome’s claim to universal jurisdiction, and the place of the See of Constantinople in relation to the Pentarchy. By the turn of the millennium, the Eastern and Western Roman Empires had been gradually separating along religious fault lines for centuries, beginning with Emperor Leo III’s pioneering of the Byzantine Iconoclasm in 730 CE, in which he declared the worship of religious images to be heretical. The Western Church remained firmly in support of the use of religious images. Leo tried to use military force to compel Pope Gregory III, but he failed, and the pope condemned Leo’s actions. In response, Leo confiscated papal estates and placed them under the governance of Constantinople. Therefore, the Iconoclasm widened the growing divergence and tension between east and west, though the church was still unified at this time. It also decisively ended the so-called Byzantine Papacy, under which, since the reign of Justinian I a century before, the popes in Rome had been nominated or confirmed by the emperor in Constantinople. The deference of the Western Church to Constantinople dissolved, and Rome would maintain a consistently iconodule position (meaning it supports or is in favor of religious images or icons and their veneration). Regent Irene convened the Second Council of Nicaea in 787 CE, which temporarily restored image worship, in an attempt to soothe the strained relations between Constantinople and Rome—but it was too late. After Charlemagne, the king of the Franks, saved Rome from a Lombard attack, Pope Leo III (not to be confused with the Byzantine Leo III) declared him the new Roman emperor in 800 CE, since a woman (Irene) could not be emperor. It was also a message that the popes were now loyal to the Franks, who could protect them, instead of the Byzantines, who had only caused trouble. To the Byzantines, this was an outrage, attacking their claim to be the true successors of Rome. From this point on, the Frankish Empire is usually known as the Holy Roman Empire. With two Roman empires, the Byzantines and the Franks, the authority of the Byzantine Empire was weakened. In the west they were no longer called “Romans,” but “Greeks” (and eventually “Byzantines”). The Byzantines, however, continued to consider themselves Romans, and looked to the patriarch of Constantinople, not the pope, as the most important religious figure of the church. The differences in practice and worship between the Church of Rome in the west and the Church of Constantinople in the east only increased over time. Finally, in 1054 CE, relations between the Eastern and Western traditions within the Christian Church reached a terminal crisis. The papal legate sent by Leo IX traveled to Constantinople for purposes that included refusing to Cerularius the title of “Ecumenical Patriarch,” and insisting that he recognize the Pope’s claim to be the head of all the churches. The main purpose of the papal legation was to seek help from the Byzantine emperor in view of the Norman conquest of southern Italy, and to deal with recent attacks by Leo of Ohrid against the use of unleavened bread and other Western customs, attacks that had the support of Cerularius. Historian Axel Bayer contends that the legation was sent in response to two letters, one from the emperor seeking assistance in arranging a common military campaign by the Eastern and Western Empires against the Normans, and the other from Cerularius. On the refusal of Cerularius to accept the demand, the leader of the legation, Cardinal Humbert of Silva Candida, excommunicated him, and in return Cerularius excommunicated Humbert and the other legates. This was only the first act in a centuries-long process that eventually became a complete schism. The gradual separation of the last several centuries culminated in a formal declaration of institutional separation between east, into the Orthodox Church (now Eastern Orthodox Church), and west, into the Catholic Church (now Roman Catholic Church). This was known as the East-West Schism. The East-West Schism: The religious distribution after the East-West Schism between the churches of the Byzantine Empire and the Holy Roman Empire in 1054 CE. The church split along doctrinal, theological, linguistic, political, and geographical lines, and the fundamental breach has never been healed, with each side sometimes accusing the other of having fallen into heresy and of having initiated the division. Conflicts over the next several centuries (such as the Crusades, the Massacre of the Latins in 1182 CE, the west’s retaliation in the Sacking of Thessalonica in 1185 CE, the capture and sack of Constantinople in 1204 CE, and the imposition of Latin patriarchs) would only make reconciliation more difficult. The Byzantine Empire had a long and tumultuous relationship with the Bulgar Empire to its north. The Bulgarian Empire was founded in the 5th century and continued to expand and clash with the Byzantine Empire for centuries. During a period of peace, in 864 the Bulgar Empire converted to Christianity and adopted many Byzantine cultural practices. Ending 80 years of peace between the two states, the powerful Bulgarian tsar Simeon I invaded in 894, but was pushed back by the Byzantines. In 971, John I Tzimiskes, the Byzantine emperor, subjugated much of the weakening Bulgarian Empire. In 1185, however, Bulgarians Theodore Peter and Ivan Asen started a revolt, and the weakening Byzantine Empire, facing internal dynastic troubles of its own, was unable to prevent the revolt from being successful. In 1396, Bulgaria fell to the Ottoman Turks, and in 1453, Constantinople was captured. Since both became part of the Ottoman Empire, this was the end of the long series of Bulgarian-Byzantine Wars. lingua franca: A language or dialect systematically used to make communication possible between people who do not share a native language or dialect. Bulgarian: A South Slavic ethnic group who are native to Bulgaria and neighbouring regions. The First Bulgarian Empire was a medieval Bulgarian state that existed in southeastern Europe between the 7th and 11th centuries CE. It was founded circa 681, when Bulgar tribes led by Asparukh moved to the northeastern Balkans. There they secured Byzantine recognition of their right to settle south of the Danube, by defeating—possibly with the help of local South Slavic tribes—the Byzantine army led by Constantine IV. At the height of its power, Bulgaria spread from the Danube Bend to the Black Sea, and from the Dnieper River to the Adriatic Sea. As the state solidified its position in the Balkans, it entered into a centuries-long interaction, sometimes friendly and sometimes hostile, with the Byzantine Empire. Bulgaria emerged as Byzantium ‘s chief antagonist to its north, resulting in several wars. The two powers also enjoyed periods of peace and alliance, most notably during the Second Arab siege of Constantinople, where the Bulgarian army broke the siege and destroyed the Arab army, thus preventing an Arab invasion of southeastern Europe. Byzantium had a strong cultural influence on Bulgaria, which also led to the eventual adoption of Christianity in 864. After the adoption of Christianity, Bulgaria became the cultural center of Slavic Europe. Its leading cultural position was further consolidated with the invention of the Glagolitic and Early Cyrillic alphabets shortly after in the capital of Preslav, and literature produced in Old Bulgarian soon began spreading north. Old Bulgarian became the lingua franca of much of eastern Europe and it came to be known as Old Church Slavonic. In 927, the fully independent Bulgarian Patriarchate was officially recognized. The Byzantine-Bulgarian Wars were a series of conflicts fought between the Byzantines and Bulgarians, which began when the Bulgars first settled in the Balkan peninsula in the 5th century, and intensified with the expansion of the Bulgarian Empire to the southwest after 680 CE. The Byzantines and Bulgarians continued to clash over the next century with variable success, until the Bulgarians, led by Krum, inflicted a series of crushing defeats on the Byzantines. After Krum died in 814, his son, Omurtag, negotiated a thirty-year peace treaty. The traditional struggle with the See of Rome continued through the Macedonian period, spurred by the question of religious supremacy over the newly Christianized state of Bulgaria. Ending 80 years of peace between the two states, the powerful Bulgarian tsar, Simeon I, invaded in 894 but was pushed back by the Byzantines, who used their fleet to sail up the Black Sea to attack the Bulgarian rear, enlisting the support of the Hungarians. The Byzantines were defeated at the Battle of Boulgarophygon in 896, however, and agreed to pay annual subsidies to the Bulgarians. In 971 John I Tzimiskes, the Byzantine emperor, subjugated much of the weakening Bulgarian Empire, as it faced wars with Russians, Pechenegs, Magyars and Croatians, and by defeating Boris II and capturing Preslav, the Bulgarian capital. Byzantine Emperor Basil II completely conquered Bulgaria in 1018, as a result of the 1014 Battle of Kleidion. There were rebellions against Byzantine rule from 1040 to 1041, and in the 1070s and the 1080s, but these failed. In 1185, however, Theodore Peter and Ivan Asen started a revolt, and the weakening Byzantine Empire, facing internal dynastic troubles of its own, was unable to prevent the revolt from being successful. The rebellion failed to immediately capture Bulgaria’s historic capital, Preslav, but established a new capital city at Tărnovo, presumably the center of the revolt. In 1186, the rebels suffered a defeat, but Isaac II Angelos failed to exploit his victory and returned to Constantinople. With the help of the chiefly Cuman population north of the Danube, Peter and Asen recovered their positions and raided into Thrace. When Isaac II Angelos penetrated into Moesia again in 1187, he failed to capture either Tărnovo or Loveč, and he signed a treaty effectively recognizing the Second Bulgarian Empire, but neither side had any intention of keeping the peace. Fighting continued until 1396, when Bulgaria fell to the Ottoman Turks, and 1453, when Constantinople was captured. Since both became part of the Ottoman Empire, this was the end of the long series of Bulgarian-Byzantine Wars. Bulgarians Fighting the Byzantines: A Byzantine painting depicting Bulgarians slaughtering Byzantines, who can be seen with halos on their head. In 1071, the Byzantine Empire suffered two important defeats, against the Turks in the Battle of Manzikert, and against the Normans in Bari. These are sometimes called the Double Disasters. A number of wars between the Normans and the Byzantine Empire were fought from c. 1040 until 1185. In 1071, the Byzantines were defeated by the Normans during their conquest of Italy, thereby driving the Byzantines from southern Italy. Even more dangerous than the Normans was a new enemy from the steppe: the Turks. The Battle of Manzikert was fought between the Byzantine Empire and the Seljuq Turks on August 26, 1071, and proved a decisive defeat of the Byzantine army. This defeat and the capture of the emperor Romanos IV Diogenes played an important role in undermining Byzantine authority in Anatolia and Armenia, the heartland of the Byzantine Empire. Battle of Manzikert: A major battle between the Byzantines and the Turks that ended in a Byzantine defeat and ushered in the decline of the Byzantine Empire. Normans: The people who in the 10th and 11th centuries gave their name to Normandy, a region in France. They were descended from Norse raiders and pirates from Denmark, Iceland, and Norway who, under their leader Rollo, agreed to swear fealty to King Charles III of West Francia. A number of wars between the Normans and the Byzantine Empire were fought from 1040 until 1185, when the last Norman invasion of Byzantine territory was defeated. At the end of the conflict, neither the Normans nor the Byzantines could boast much power. A Byzantine defeat in 1071 proved decisive for the disintegration and collapse of the empire. The Normans had come from the Duchy of Normandy in West Francia, which in 911 had been granted to the Viking Rollo in the Treaty of Saint-Clair-sur-Epte by the French king Charles the Simple. The Normans and their new land took the name of these “Northmen.” During the time that the Normans had conquered southern Italy, and the Byzantine Empire was in a state of internal decay; the administration of the empire had been wrecked, and the efficient government institutions that provided Basil II with a quarter of a million troops and adequate resources by taxation had collapsed within a period of three decades. Attempts by Isaac I Komnenos and Romanos IV Diogenes to reverse the situation proved unfruitful. The premature death of the former, and the overthrow of the latter, led to further collapse as the Normans consolidated their conquest of Sicily and Italy. Reggio Calabria, the capital of the tagma of Calabria, was captured by Robert Guiscard in 1060. At the time, the Byzantines held a few coastal towns in Apulia, including the capital of the catepanate of Italy, Bari. Otranto was besieged and fell in October 1068; in the same year, the Normans besieged Bari itself, and, after defeating the Byzantines in a series of battles in Apulia, and after any attempt of relief had failed, the city surrendered in April 1071, ending the Byzantine presence in southern Italy. The Norman adventurer Robert Guiscard allied with the pope to drive the remaining Byzantines from southern Italy and replace them with a Roman Catholic Norman Kingdom. Guiscard was incredibly successful, and he turned his eye to conquering the entire Byzantine Empire. He crossed over into Greece, pillaged the countryside, and defeated the Byzantine army at the Battle of Dyrrhachium in 1081 CE. He died before he could complete his conquests, but southern Italy would never again be ruled by the Byzantine Empire. Even more dangerous than the Normans was a new enemy from the steppe, the Turks. These former pastoral nomads converted to Islam and ushered in a new phase of Islamic conquests. While the Normans were pillaging Italy, the Turks invaded Asia Minor. Emperor Romanos Diogenes moved the Byzantine army to meet them. At the Battle of Manzikert in 1071 CE, the Byzantine army was totally wiped out by the Turks. It was perhaps the most severe military disaster in Byzantine history. With this defeat, Anatolia fell into the hands of the Turks. Anatolia had been the heartland of the Byzantine Empire, the home of most of its soldiers and farmers. This defeat at Manzikert meant that the theme system, which had effectively supplied Byzantium with its army, was destroyed. The Byzantine Empire was now vulnerable to conquest. Battle of Manzikert: In this 15th-century French miniature depicting the Battle of Manzikert, the combatants are clad in contemporary western European armor. The brunt of the battle was borne by the professional soldiers from the eastern and western tagmata, as large numbers of mercenaries and Anatolian levies fled early and survived the battle. The fallout from Manzikert was disastrous for the Byzantines, resulting in civil conflicts and an economic crisis that severely weakened the Byzantine Empire’s ability to adequately defend its borders. This led to the mass movement of Turks into central Anatolia—by 1080, an area of 78,000 square kilometers (30,000 sq. miles) had been gained by the Seljuk Turks. It took three decades of internal strife before Alexius I (1081 to 1118) restored stability to Byzantium. Historian Thomas Asbridge says, “In 1071, the Seljuqs crushed an imperial army at the Battle of Manzikert (in eastern Asia Minor), and though historians no longer consider this to have been an utterly cataclysmic reversal for the Greeks, it still was a stinging setback.” It was the first time in history a Byzantine emperor had become the prisoner of a Muslim commander. Years and decades later, Manzikert came to be seen as a disaster for the empire; later sources, therefore, greatly exaggerate the numbers of troops and the number of casualties. Byzantine historians would often look back and lament the “disaster” of that day, pinpointing it as the moment the decline of the empire began. It was not an immediate disaster, but the defeat showed the Seljuks that the Byzantines were not invincible—they were not the unconquerable, millennium-old Roman Empire (as both the Byzantines and Seljuks still called it). The usurpation of Andronikos Doukas also politically destabilized the empire, and it was difficult to organize resistance to the Turkish migrations that followed the battle. Tensions between eastern and western European powers boiled over during the Komnenian Dynasty; the west destroyed Constantinople and, with it, the Byzantine Empire. The Komnenian Dynasty saw a restoration of the empire after the disastrous defeat by the Turks. But, for the first time, the Byzantines had to look to the estranged western Europe for help. The west came to the aid of the east, but tensions mounted between them until 1182 CE, when riots escalated into a massacre of tens of thousands of Latins. Two decades later, western European knights sacked Constantinople in the Fourth Crusade. This was a disaster for the Byzantine Empire, which for all purposes ceased to exist. The leaders of several states fought over who would become the new Byzantine emperor and regain control; the Empire of Nicaea won. First Crusade: The 1095 CE campaign begun by the pope in the Holy Roman Empire to win back Jerusalem from the Muslims. In 1081 CE, with the attacks from the Normans and Turks reaching their height, a new emperor, Alexios I, came to the throne. His dynasty, the Komnenian Dynasty, would oversee a restoration of the empire after these disasters. But for the first time, the Byzantines would have to look west for help, to their estranged fellow Christians in western Europe. Although western Europe had a history of religious disagreements with the Byzantines, they now realized that the Byzantine Empire was all that was holding back the Muslims from invading Europe. Having achieved stability in the west, Alexios could turn his attention to the severe economic difficulties and the disintegration of the empire’s traditional defenses. However, he still did not have enough manpower to recover the lost territories in Asia Minor, and to advance against the Seljuks. At the Council of Piacenza in 1095, envoys from Alexios spoke to Pope Urban II about the suffering of the Christians of the east, and underscored that without help from the west, they would continue to suffer under Muslim rule. Urban saw Alexios’ request as a dual opportunity to cement western Europe and reunite the Eastern Orthodox Churches with the Roman Catholic Church under his rule. On November 27, 1095, Pope Urban II called together the Council of Clermont, and urged all those present to take up arms under the sign of the cross, and launch an armed pilgrimage to recover Jerusalem and the east from the Muslims. The response in western Europe was overwhelming. Alexios had anticipated help in the form of mercenary forces from the west, but he was totally unprepared for the immense and undisciplined force which soon arrived in Byzantine territory. It was no comfort to Alexios to learn that four of the eight leaders of the main body of the Crusade were Normans, among them Bohemund. Relations were rocky from the start. To the Byzantines, the crusaders were dirty, uneducated brutes. To the crusaders, the Byzantines were untrustworthy, over-pampered schemers. Still, they tried to work together. 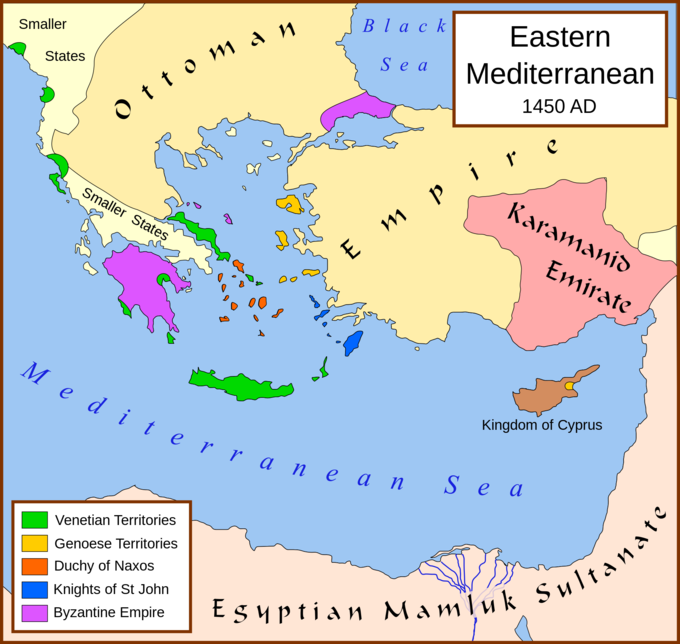 The Byzantines and crusaders agreed that whatever formerly Byzantine lands the crusaders recaptured from the Turks would be returned to Byzantine control. The crusaders went back on this agreement, however, and took the lands for themselves. The crusaders succeeded in conquering Jerusalem in 1099 CE, but the Byzantines had come to regard them as just as big a threat as the Muslims. The First Crusade: The capture of Jerusalem in 1099 CE marked the success of western Europe’s First Crusade against the Muslims. Still, thanks to the Crusades, the Byzantines were able to reassert control of Anatolia. Emperor Alexios created a new system of leasing land in exchange for military service, called the Pronoia System, which was similar to the old theme system. Under his successors, the Byzantines did not win any major victories, but they were able to keep the Turks out of Byzantium ‘s Anatolian heartland. At the same time, in order to secure military aid from the western powers, the Byzantine emperors had granted financial and trade concessions to Italy. Large numbers of Italian merchants settled in Constantinople and put the local merchants out of business. Tensions between them and the Byzantines of the city worsened. In 1182 CE, these tensions spilled over into riots and a massacre of Latins (the people from western Europe) by an angry mob. Tens of thousands were killed. The recent anti-Latin resentment in the empire led to the Crusader states losing their protection from Byzantium. However, while the Crusader states did not rely on Byzantium for protection, the Byzantines certainly did in that it kept the aggressive expansionism of Islam in check. In 1198 CE, the pope called a new crusade to permanently secure western Europe’s hold on Jerusalem. When the western Europeans arrived at Constantinople in 1204 CE, they found civil war among the Byzantines. In part sparked by the massacre of the Latins of 1182 CE, and in part motivated by the tempting wealth of Constantinople, the western European knights sacked Constantinople, in what is known as the Fourth Crusade. They pillaged the city, carrying away the vast wealth amassed over nine centuries in the Byzantine capital. For this reason, many great examples of Byzantine art can be found today in Venice, especially at St. Mark’s Cathedral. The sack was a disaster for the Byzantine Empire, which for all purposes ceased to exist. The crusaders parceled out Byzantine lands among themselves. Constantinople became the capital of a new empire, called the Latin Empire, ruled by western knights. Constantinople was considered as a bastion of Christianity that defended Europe from the advancing forces of Islam, and the Fourth Crusade’s sack of the city dealt an irreparable blow to this eastern bulwark. Although the Greeks retook Constantinople after 57 years of Latin rule, the Byzantine Empire had been crippled by the Fourth Crusade. The Fourth Crusade: An oil painting by Eugène Delacroix depicting the arrival of the Fourth Crusade in Constantinople in 1204 CE. The Siege of Constantinople in 1204 CE was a turning point in Byzantine history, but it was not the end. Several members of the Komnenian royal family had been away from the capital at the time of the sack, and they declared their own successor states. Each emperor of these states declared himself to be the rightful Byzantine emperor. They fought each other and the Latins for control of the former lands of the Byzantine Empire. It was the Empire of Nicaea, closest to Constantinople, that would be most successful. Michael VIII recaptured Constantinople and restored the Byzantine Empire, giving rise to the last dynasty of the empire and a brief time of cultural flourishing. After Constantinople was sacked by the west, and the Byzantine Empire was mostly destroyed with it, Michael VIII of the Empire of Nicaea, a smaller state, claimed the throne and founded the Palaiologos Dynasty, the longest and last dynasty of Byzantine rulers. In 1261 CE, Michael’s forces recaptured Constantinople, though it was a shell of its former self, marking the restoration of the Byzantine Empire. Michael attempted to end the schism between the Catholic and Orthodox churches, but this outraged many of his citizens, who now hated the Latins of western Europe more than even the Muslims, due to their sacking of Constantinople. During the Palaiologan Dynasty, however, the empire experienced the short but vibrant Palaiologan Renaissance, when learning, art, and philosophy flourished. Nicaean Empire: The largest of the three Byzantine Greek successor states founded by the aristocracy of the Byzantine Empire that fled after Constantinople was occupied by western European and Venetian forces during the Fourth Crusade. Palaiologan Renaissance: The short but vibrant period when emperors attempted to restore Constantinople from destruction and encouraged art, philosophy, and education. The attempt at restoring this cultural foundation occurred during the Byzantine Empire’s longest-lived dynasty in Byzantine history. Migration of Byzantine scholars at the end of this period helped to spark the Renaissance in Italy. In 1259 CE, Michael VIII came to the throne of the Empire of Nicaea. He founded the Palaiologos Dynasty, the longest and last dynasty of Byzantine rulers. In 1261 CE, Michael’s forces succeeded in capturing Constantinople while the Latin knights were off fighting elsewhere. They found the city a shell of its former self, sparsely populated and largely ruined. Still, Michael VIII returned to the city and was proclaimed emperor there, marking the restoration of the Byzantine Empire. Byzantine Coin: A gold Byzantine coin, called the hyperpyron (which replaced the earlier solidus), depicting the first emperor of the Byzantine Palaiologan Dynasty, Michael VIII. In order to protect his empire from further attacks by western knights, he attempted to end the schism between the Catholic and Orthodox churches. This outraged many of his citizens, who blamed the Catholics for the sack of Constantinople. A decisive change had taken place: among the citizens of the restored Byzantine Empire, the “Latins” of western Europe were more hated than even the Muslims. The war-ravaged empire was ill-equipped to deal with the enemies that now surrounded it. In order to maintain his campaigns against the Latins, Michael pulled troops from Asia Minor, and levied crippling taxes on the peasantry, causing much resentment. Massive construction projects were completed in Constantinople to repair the damages of the Fourth Crusade, but none of these initiatives was of any comfort to the farmers in Asia Minor, suffering raids from fanatical ghazis. As a result, Anatolia, which had formed the very heart of the shrinking empire, was systematically lost to numerous Turkic ghazis, whose raids evolved into conquering expeditions inspired by Islamic zeal. With a decreasing source of food and manpower, the Palaiologoi were forced to fight on several fronts, most of them being Christian states: the Second Bulgarian Empire, the Serbian Empire, the remnants of the Latin Empire, and even the Knights Hospitaller. The loss of land in the east to the Turks, and in the west to the Bulgarians, was complemented by two disastrous civil wars, the Black Death and the 1354 earthquake at Gallipoli, whose destruction and evacuation allowed the Turks to occupy it. By 1380, the Byzantine Empire consisted of the capital Constantinople and a few other isolated exclaves, which only nominally recognized the emperor as their lord. Nonetheless, Byzantine diplomacy coupled with the adroit exploitation of internal divisions and external threats among their enemies, and above all the invasion of Anatolia by Timur, allowed Byzantium to survive until 1453. During the Palaiologan Dynasty, the empire experienced a short but vibrant renaissance, known as the Palaiologan Renaissance. As the Palaiologan emperors attempted to restore the glory of Constantinople, they sponsored art and encouraged philosophy. Artists and philosophers looked to the classical past and rediscovered much ancient learning. Although the Palaiologan Renaissance came too late to save the struggling Byzantine civilization, it would be a major catalyst for the Italian Renaissance, especially as Byzantine artists and scholars traveled to Italy to seek shelter from the new threats that besieged the empire. Towards the 14th century, as the empire entered into a phase of terminal crisis, such achievements became less valued. All was not lost for these seemingly rejected scholars—many in Italy who had been opened up to Byzantium by the maritime expansions of Genoa and Venice came to appreciate their achievements, facilitating the Renaissance. As such, these scholars found themselves in Italian institutions, expressing their Greco-Roman culture for pay. Immigration to Italy was made less attractive by the idea of abandoning the Orthodox faith to practice Catholicism. Nonetheless, a significant and increasing number of Greeks began traveling to Italy, first temporarily, to Italian colonies such as Crete or Cyprus before returning to Byzantium, then, as the Empire began to fail horribly, in a more permanent manner. The Fall of Constantinople was marked by large amounts of Greek refugees escaping Turkic rule into Europe via Italy, and thus accelerating the Renaissance. The restored Byzantine Empire converted to Catholicism to get aid from the west against the Ottoman Turks, but the Turks defeated them by conquering Constantinople, thereby causing the final collapse of the Byzantines. The restored Byzantine Empire was surrounded by enemies. The Bulgarian Empire and the Serbian Empire conquered many Byzantine lands, and the Turks overran Asia Minor altogether. Anatolia gradually transformed from a Byzantine Christian land into an Islamic land dominated by the Turks. It would ultimately become the Ottoman Empire. The west would only provide the east with help against the Turks if the east converted from Orthodox to Catholic Christianity. This sparked riots among the eastern Orthodox populace, who hated the western Catholics for the sack of Constantinople. Meanwhile, the Ottomans defeated most of the empire except for Constantinople. The east ultimately capitulated and accepted Catholicism, but it was too late. On May 29, 1453 CE, Constantinople fell to the Ottoman Turks and the Byzantine Empire came to an end. Constantinople was transformed into the Islamic city of Istanbul. Ottoman Empire: A large empire that began as a Turkish sultanate centered on modern Turkey; founded in the late 13th century, it lasted until the end of World War I. This empire also defeated Constantinople and the Byzantine Empire in 1453 CE. Mehmed II: An Ottoman sultan who, at the age of 21, conquered Constantinople and brought an end to the Eastern Roman Empire. The restored Byzantine Empire was surrounded by enemies. The Bulgarian Empire, which had rebelled against the Byzantines centuries earlier, now matched it in strength. A new empire arose in the western Balkans, the Serbian Empire, who conquered many Byzantine lands. Even more dangerous to the Byzantines, the Turks were once again raiding Byzantine lands, and Asia Minor was overrun. With the theme system a thing of the past, the emperors had to rely on foreign mercenaries to supply troops, but these soldiers-for-hire were not always reliable. Anatolia gradually transformed from a Byzantine Christian land into an Islamic land dominated by the Turks. For a long time the Turks in Anatolia were divided up into a patchwork of small Islamic states. However, one ruler, Osman I, built up a powerful kingdom that soon absorbed all the others and formed the Ottoman Empire. In the century after the death of Osman I, Ottoman rule began to extend over the eastern Mediterranean and the Balkans. Osman’s son, Orhan, captured the city of Bursa in 1324 and made it the new capital of the Ottoman state. The fall of Bursa meant the loss of Byzantine control over northwestern Anatolia. The important city of Thessaloniki was captured from the Venetians in 1387. The Ottoman victory at Kosovo in 1389 effectively marked the end of Serbian power in the region, paving the way for Ottoman expansion into Europe. The Battle of Nicopolis in 1396, widely regarded as the last large-scale crusade of the Middle Ages, failed to stop the advance of the victorious Ottoman Turks. With the extension of Turkish dominion into the Balkans, the strategic conquest of Constantinople became a crucial objective. The empire controlled nearly all former Byzantine lands surrounding the city, but the Byzantines were temporarily relieved when Timur invaded Anatolia in the Battle of Ankara in 1402. He took Sultan Bayezid I as a prisoner. The capture of Bayezid I threw the Turks into disorder. The state fell into a civil war that lasted from 1402 to 1413, as Bayezid’s sons fought over succession. It ended when Mehmed I emerged as the sultan and restored Ottoman power. When Mehmed I’s grandson, Mehmed II (also known as Mehmed the Conquerer) ascended to the throne in 1451, he devoted himself to strengthening the Ottoman navy and made preparations for the taking of Constantinople. Against all these enemies, the Byzantines could only look west in search of help. The pope, however, continued to stress that aid would only come if the Byzantines adopted the Catholicism of the Latin church. While the Byzantine emperors were willing to do so in order to save their empire, the populace hated the Catholics for the sack of Constantinople, and so attempts to reconcile with the Catholic Church only led to riots. Further theological disagreements inflamed the bitterness between the Orthodox and the Catholics. While civil war and religious disputes occupied the Byzantines, the Ottomans slowly closed in on the empire. They crossed into Europe and annexed most of the lands around Constantinople. By 1400 CE, the Byzantine Empire was little more than the city-state of Constantinople. It was clear that the only way they would receive Europe-wide help in pushing back the Ottomans was if they reconciled with the Catholic Church. This was not acceptable for most Byzantines. A popular saying at the time was “Better the Turkish turban than the Papal tiara.” In other words, the Orthodox Byzantines considered it better to be ruled by the Muslim Turks than to go against their religious beliefs and give in to the Catholic Church. Still, the emperors realized that Byzantium would soon fall without help from the west. In 1439 CE, Emperor John VIII Palaiologos and the most important Byzantine bishops reached an agreement with the Catholic Church at the Council of Florence, in which they accepted Catholic Christianity. When the bishops returned to the Byzantine Empire, however, they found themselves under attack by their congregations. Their agreement to join the Catholic Church was exceedingly unpopular. The Rise of the Ottoman Empire: The borders of the Byzantine and Ottoman Empires in the eastern Mediterranean just before the fall of Constantinople in 1453 CE. By this stage, Constantinople was underpopulated and dilapidated. The population of the city had collapsed so severely that it was now little more than a cluster of villages separated by fields. On April 2, 1453, the Ottoman army, led by the 21-year-old Sultan Mehmed II, laid siege to the city with 80,000 men. Despite a desperate last-ditch defense of the city by the massively outnumbered Christian forces (7,000 men, 2,000 of whom were sent by Rome), Constantinople finally fell to the Ottomans after a two-month siege on May 29, 1453. The last Byzantine emperor, Constantine XI Palaiologos, was last seen casting off his imperial regalia and throwing himself into hand-to-hand combat after the walls of the city were taken. On the third day after the fall of our city, the Sultan celebrated his victory with a great, joyful triumph. He issued a proclamation: the citizens of all ages who had managed to escape detection were to leave their hiding places throughout the city and come out into the open, as they to were to remain free and no question would be asked. He further declared the restoration of houses and property to those who had abandoned our city before the siege, if they returned home, they would be treated according to their rank and religion, as if nothing had changed. The capture of Constantinople (and two other Byzantine splinter territories soon thereafter) marked the end of the Roman Empire, an imperial state that had lasted for nearly 1,500 years. The Ottoman conquest of Constantinople also dealt a massive blow to Christendom, as the Islamic Ottoman armies thereafter were left unchecked to advance into Europe without an adversary to their rear. After the conquest, Sultan Mehmed II transferred the capital of the Ottoman Empire from Edirne to Constantinople. Constantinople was transformed into an Islamic city: the Hagia Sophia became a mosque, and the city eventually became known as Istanbul. The conquest of the city of Constantinople, and the end of the Byzantine Empire, was a key event in the Late Middle Ages, which also marks, for some historians, the end of the Middle Ages. 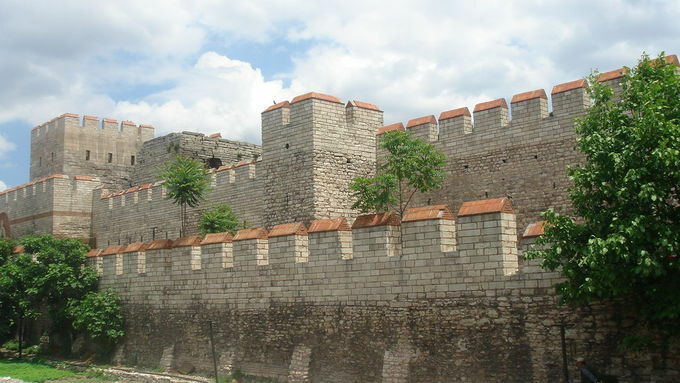 The Walls of Constantinople: Sometimes known as “The Great Wall of Europe,” the walls of Constantinople stood strong for centuries. Yet in 1453, they fell to the Ottoman Turks. The Byzantine Empire had a lasting legacy in religion, architecture, art, literature, and law. The Byzantine Empire had lasting legacies on many subsequent cultures. The Byzantine Empire insulated Europe from enemies and gave it the time it needed to recover from the chaotic medieval period. Byzantium ‘s role in shaping Orthodoxy was also hugely influential; the modern-day Eastern Orthodox Church is the second largest Christian church in the world. Byzantine architecture, particularly in religious buildings, can be found in diverse regions, from Egypt and Arabia to Russia and Romania. Byzantine painting from this period would have a strong influence on the later painters of the Italian Renaissance. lingua franca: A common language used by people of diverse backgrounds to communicate with one another; often a basic form of speech with simplified grammar. Byzantium has been often identified with absolutism, orthodox spirituality, orientalism and exoticism, while the terms “Byzantine” and “Byzantinism” have been used as metaphors for decadence, complex bureaucracy, and repression. Both eastern and western European authors have often perceived Byzantium as a body of religious, political, and philosophical ideas contrary to those of the west. Even in 19th-century Greece, the focus was mainly on the classical past, while Byzantine tradition had been associated with negative connotations. This traditional approach towards Byzantium has been partially or wholly disputed and revised by modern studies, which focus on the positive aspects of Byzantine culture and legacy. Historian Averil Cameron, for example, regards the Byzantine contribution to the formation of medieval Europe undeniable, and both Cameron and Obolensky recognize the major role of Byzantium in shaping Orthodoxy. The Byzantines also preserved and copied classical manuscripts, and they are thus regarded as transmitters of the classical knowledge, as important contributors to the modern European civilization, and as precursors of both the Renaissance humanism and the Slav Orthodox culture. Following the conquest of Constantinople by the Ottoman Turks in 1453, Sultan Mehmed II took the title “Kaysar-i Rûm” (the Ottoman Turkish equivalent of Caesar of Rome ), since he was determined to make the Ottoman Empire the heir of the Eastern Roman Empire. Constantinople in the Byzantine era: An artist-restructured photo of what the city of Constantinople looked like during the Byzantine era. Orthodoxy now occupies a central position in the history and societies of Greece, Bulgaria, Russia, Serbia, and other countries. Following the conquest of Constantinople by the Ottoman Turks in 1453 CE, the Ottomans regarded themselves as the “heirs” of Byzantium and preserved important aspects of its tradition, which in turn facilitated an “Orthodox revival” during the post-communist period of the eastern European states. The modern-day Eastern Orthodox Church is the second largest Christian church in the world. Modern-Day Eastern Orthodoxy: Distribution of Eastern Orthodox Christians in the world by country, as of 2012. Darker blues indicate main religion (over 50%). After the fall of Rome, the key challenge to the empire was to maintain a set of relations between itself and its neighbors. When these nations set about forging formal political institutions, they often modeled themselves on Constantinople. Byzantine diplomacy soon managed to draw its neighbors into a network of international and inter-state relations. This network revolved around treaty-making, and included the welcoming of the new ruler into the family of kings, as well as the assimilation of Byzantine social attitudes, values and institutions. The preservation of the ancient civilization in Europe was due to the skill and resourcefulness of Byzantine diplomacy, which remains one of Byzantium’s lasting contributions to the history of Europe. In the field of law, Justinian I ‘s reforms to the legal code would come to serve as the basis of not only Byzantine law, but law in many European countries, and continues to have a major influence on public international law to this day. Leo III’s Ecloga influenced the formation of legal institutions in the Slavic world. In the 10th century, Leo VI the Wise achieved the complete codification of the whole of Byzantine law in Greek, which became the foundation of all subsequent Byzantine law, which generates interest to the present day. Influences from Byzantine architecture, particularly in religious buildings, can be found in diverse regions, from Egypt and Arabia to Russia and Romania. During the Byzantine Renaissance of the Macedonian Dynasty, art and literature flourished, and artists adopted a naturalistic style and complex techniques from ancient Greek and Roman art, mixing them with Christian themes. Byzantine painting from this period would have a strong influence on the later painters of the Italian Renaissance. The migration waves of Byzantine scholars and émigrés in the period following the sacking of Constantinople and the fall of Constantinople in 1453 is considered by many scholars to be key to the revival of Greek and Roman studies that led to the development of the Renaissance in humanism and science. These émigrés were grammarians, humanists, poets, writers, printers, lecturers, musicians, astronomers, architects, academics, artists, scribes, philosophers, scientists, politicians and theologians. They brought to western Europe the far greater preserved and accumulated knowledge of their own (Greek) civilization. Byzantine Encyclopedia: A page from a 16th-century edition of the vast Byzantine encyclopedia, the Suda.